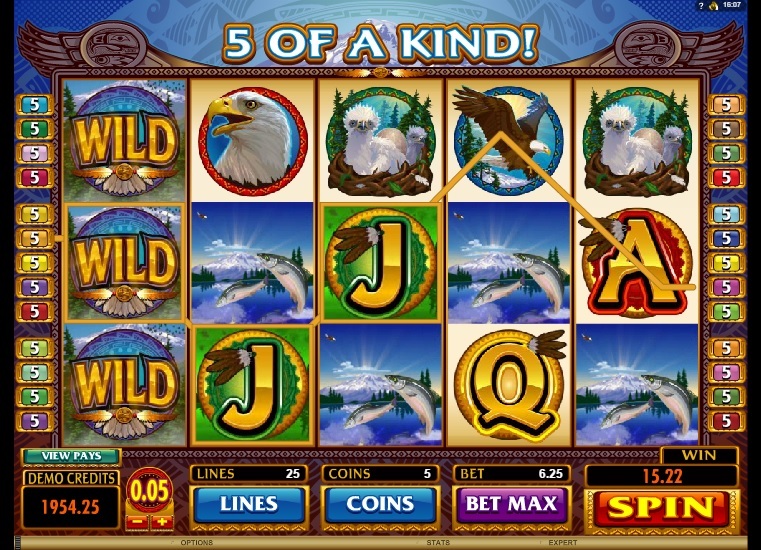 Eagle’s Wings, a beautiful nature-themed online video slot released by Microgaming, challenges players to win plenty of coins through special features such as free spins with tripled wins and wild multiplier. To play Eagle’s Wings for real money, players have to select number of paylines, a coin value from the range of $0.01 to $0.25, and number of coins up to five per active line. The betting range for Eagle’s Wings is $0.01 to $100.00, which makes this slot ideal for players with different bankroll sizes. Once they have placed their bets, players must hit the Spin button to set the reels spinning. If a winning combination of symbols is displayed at the end of a spin, players will receive a payout. The game can be played in the regular mode or the expert mode. The regular mode lacks advanced features while the expert mode offers all the regular mode features along with advanced features such as Autoplay, Spin 5x option, Spin 10x option, and Spins option. Eagle’s Wings is one of the most beautiful slots in Microgaming’s portfolio. Set in the midst of North America’s unspoiled natural beauty, majestic mountains, and green forests, the slot gives players a chance to study the habitat and lifestyle of eagles. The graphics are beautiful, the animations are apt, and the sound effects can entertain players no end. The reels feature symbols of Eagle’s Flight, Eagle’s Nest, Salmon, Eagle’s Head, and regular high-value card symbols decorated with eagle’s feathers. The Eagle’s Wings symbol serves as the wild multiplier, substituting for other symbols across the reels and helping players complete winning combinations. If players use the Eagle’s Wings to complete winning combinations, their payouts for those combinations will be doubled. However, payouts for combinations of Eagle’s Wings symbols do not get doubled. If players hit a combination of five Eagle’s Wings symbols, they will win only 1,000 coins, not it’s double. The Eagle Coin symbol serves as the scatter. If players land at least three Eagle’s Coin symbols anywhere on the reels, the free spins bonus round gets activated. Players can win as many as 60 free games with tripled wins. To find out exactly how many free games they will get, players should click on the Eagle’s Coins symbols. Microgaming’s Eagle’s Wings is definitely worth playing not just for its unique theme, but also for its enormous wins. Players can win up to 31,250 coins in the base game alone and a further 93,750 in the free spins round. In addition, there is the top jackpot of 1000 coins and the second biggest payout of 500 coins to play for. Eagle’s Wings is available for fun or real money play at any online casino that operates on the Microgaming software platform.